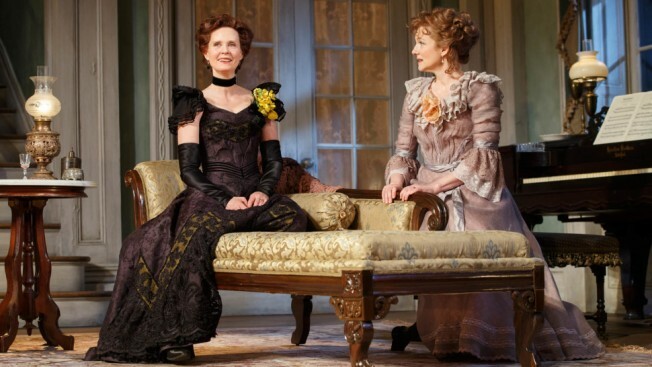 Cynthia Nixon as Regina and Laura Linney as Birdie in "The Little Foxes"
The Manhattan Theater Club's powerful and chilling interpretation of Lillian Hellman’s 1939 Southern family drama "The Little Foxes," now open, has Emmy-winning actresses Laura Linney and Cynthia Nixon alternating the roles of heartless Regina Giddens and her frail, alcoholic sister-in-law Birdie Hubbard. It’s an unusual, though not unprecedented casting exploit. In repertory theater, actors stage different plays on different nights — think, Patrick Stewart and Ian McKellan toggling between Harold Pinter and Samuel Beckett on Broadway a few years ago. It’s more rare to see actors swap roles within the same play. Perhaps the last time the technique made headlines was a 2011 National Theatre production of “Frankenstein” in London, which had Benedict Cumberbatch and Jonny Lee Miller switching between Victor Frankenstein and his monstrous creation. As it is, there are plenty of monsters in director Daniel Sullivan’s exciting staging of the Hellman play. "Foxes" — the title is a Biblical reference — centers on three untrustworthy siblings who fight among themselves as they circle a Chicago businessman, hoping to ink a deal that will bring a cotton mill to their Alabama hometown. Regina is the imperious sister, bitter that her father’s estate went to brothers Ben and Oscar (Michael McKean and Darren Goldstein). Forced to marry in order to maintain her status, she entered into a loveless relationship with Horace (Richard Thomas), a banker who as the play begins is away in Baltimore being treated for a heart condition. To bolster the siblings’ financial position — and with no concern for how the trip might affect her ailing husband — Regina sends their naive teenage daughter Alexandra (Francesca Carpanini) to fetch Horace and bring him back to the family home. But his return only brings more trouble her way. The story is filled with delicious twists and turns up until the end. But the fun in this production is watching these two extraordinary and captivating actresses at play, no matter which role they're tackling. Linney approaches Regina as a headstrong and conniving cynic. Almost sinister in nature, she commands the room with equal ferociousness as the men around her — determined to achieve her dreams at any cost. You'll both fear her and cheer for her. Nixon plays the part more coyly, giving a false veneer of proper smiling Southern manners. She's equally power-hungry, just more methodical in the moves she makes — and her final strike will take you by surprise in the best possible way. Think of her as the Aaron Burr to Linney's Alexander Hamilton. Nixon's Regina is playing by the rules, while Linney's is breaking them. In the second casting configuration, Linney portrays sensitive Birdie as something of a demure drunk. Nixon’s Birdie? More of a wounded dove — mentally frail and utterly miserable. Both prove to be equally effective in either role — a sign of each actress' talent and the production's overall perfection. Regina’s is the meatier part with the most stage time, storing through all three acts. Birdie’s one truly memorable appearance occurs at the start of the third act, with a touching speech about how rarely she’s experienced happiness. As they change, so do the supporting characters around them. Richard Thomas delivers a particularly physical performance as Horace, who sees the world with the clarity of a dying man. His moves to punish Regina's ambition read more vengeful with Linney, and more controlling with Nixon. McKean is in excellent form as the greedy, unscrupulous decision-maker of the Hubbard clan. Caroline Stefanie Clay and Charles Turner are noteworthy as Addie and Cal, the loyal household staffers who are vestiges of the antebellum South. Clay’s Addie, in particular, stands out for her willingness to defy her employer and prioritize Alexandra’s best interests. There are contemporary themes in the 2 hour, 30 minute play (performed with two intermissions) particularly in the context of America’s widening class divide. Towards the end of the drama, that becomes epesically clear when McKean’s by-then defeated character explains to his sister: "The century’s turning, the world is open, open for people like you and me. … and they will own this country one day." 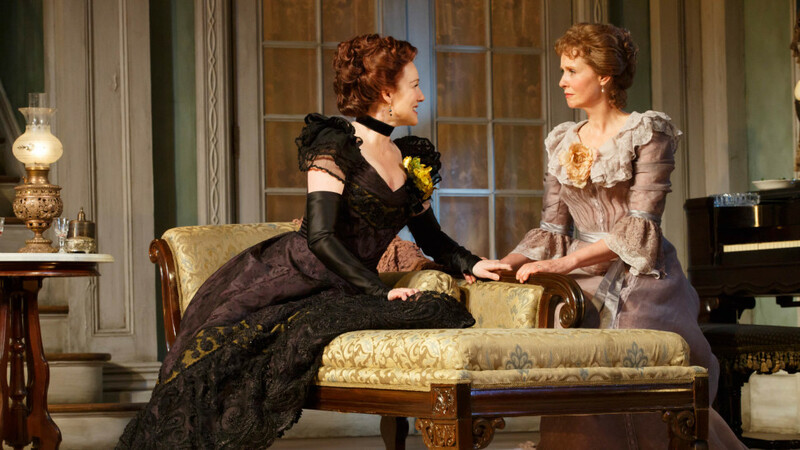 “The Little Foxes," at MTC’s Samuel J. Friedman Theatre, 261 W. 47th St. Tickets, on sale through June 18, $70-$150. Call 212-239-6200.